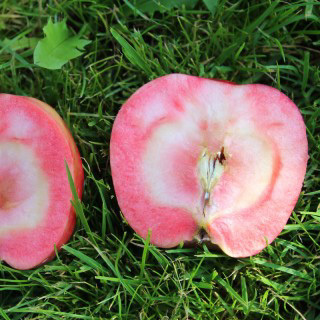 The world's first, very tasty, red-fleshed and red-flowering columnar apple that is also tolerant to scab. 80-100% of the outside skin is dark red. It has pinkish red flesh. Cut back the side shoots to 15-20 cm in July. Picking time October. This variety will only grow to around 2 metres when mature.